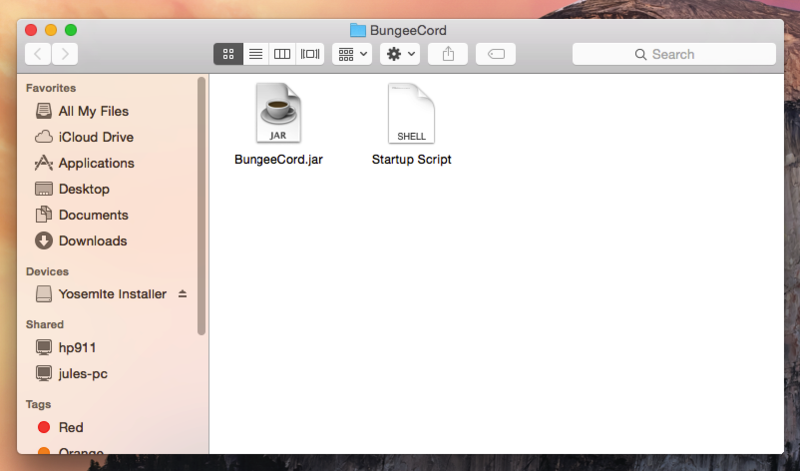 BungeeCord - The jar file we will be placing in the BungeeCord Folder. Java JRE - The files we need for BungeeCord to run. Before we start off, make sure you have all the files listed above downloaded. If you do not have them, it will make this tutorial a lot harder then it needs to be Once you have them downloaded, we can continue with the tutorial. Open jre-8u25-macosx-x64.dmg, mount the drive, and open Java 8 Update 25.pkg. If a security warning pops up, just be sure to click yes and type in your credentials. 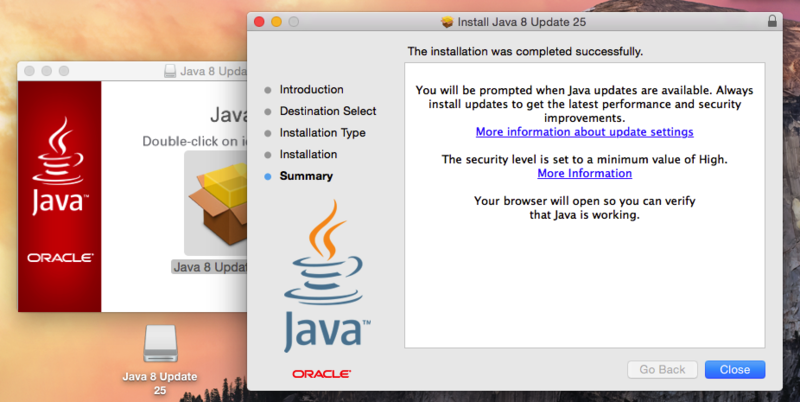 Once it is done installing, click close to finish the installer. 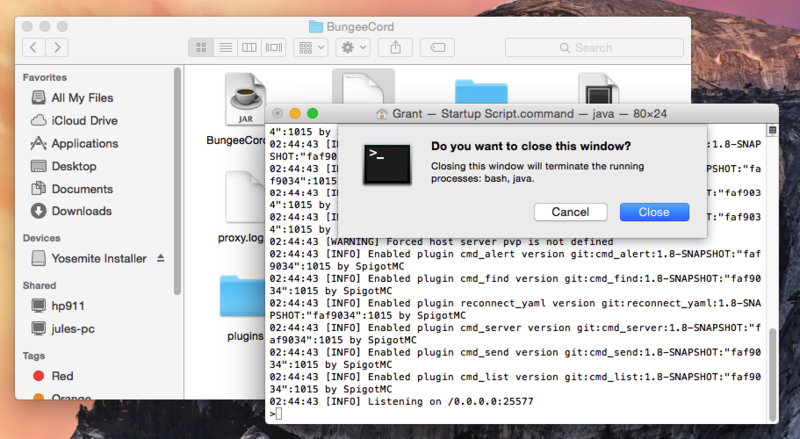 Now that we have installed Java, we are going to want to create a folder for BungeeCord and the startup script to be located in. Now we are going to give permissions for the startup script to run. 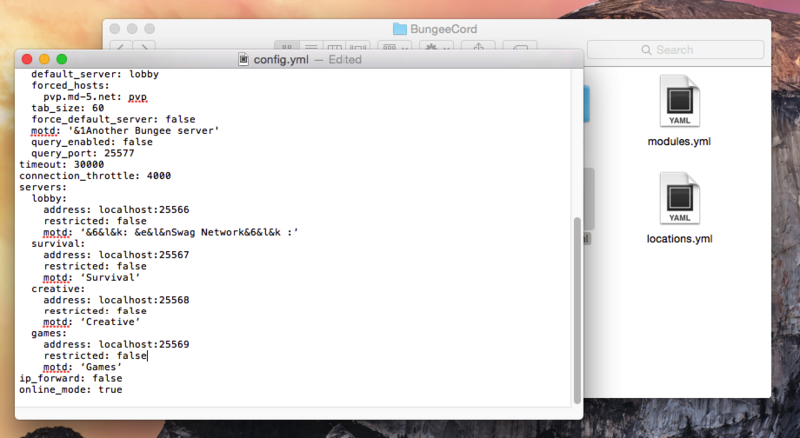 To do this we need to open the native OS X application, Terminal. You can find Terminal by either searching it in spotlight, or opening Launchpad, then (by default on the first page) by opening the folder named "Other". Make sure to include a space after this line, and not to type anything else after this. Also make sure not to press enter. Once you have done this, simply drag the startup script into the Terminal windows and press enter. Unfortunately, Terminal will not reply to you if it is successful. If it does reply to you, then make sure you have a space, or only 1 space after "chmod a+x". After you do this, you can now close Terminal. Now we can finally open BungeeCord! 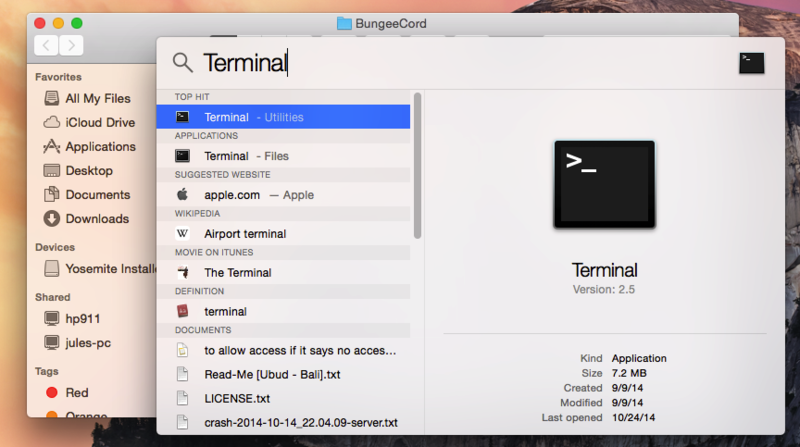 Open the startup script in your BungeeCord folder and a Terminal window will pop up, outputting the BungeeCord data. 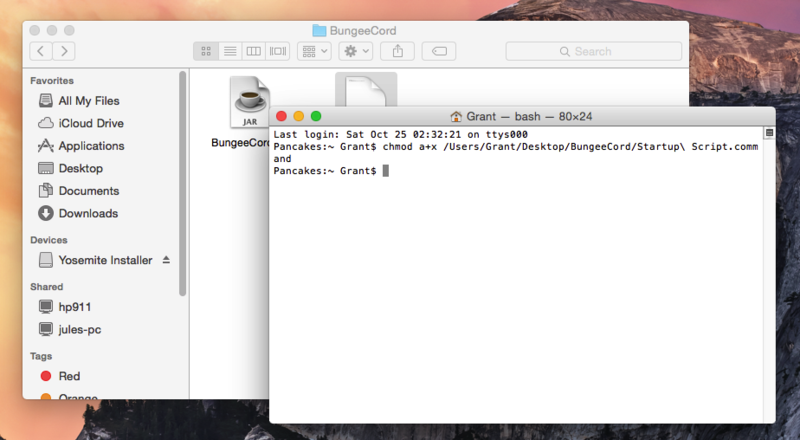 You may have also noticed that some files were downloaded and generated in our BungeeCord folder. 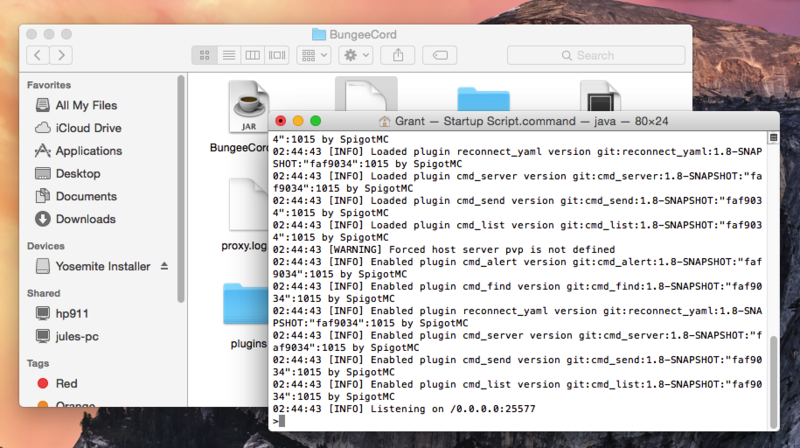 These files are the ones we need to configure in order for BungeeCord to be set up correctly. in the terminal window, we can close it. Just click close if a windows pops up asking to confirm. After we close the Terminal window we can now get down to business and start to configure BungeeCord. The only file we need to change is "config.yml". Right click the config.yml and select Open With>Other>TextEdit. I prefer the program Sublime Text 3 to open my text files, but that is just preference. TextEdit will work just fine for us. Once the file is open, scroll down to the bottom. This is where the main stuff needing configuring happens. so it is listening on the default Minecraft port, and not a hard-to-remember port. 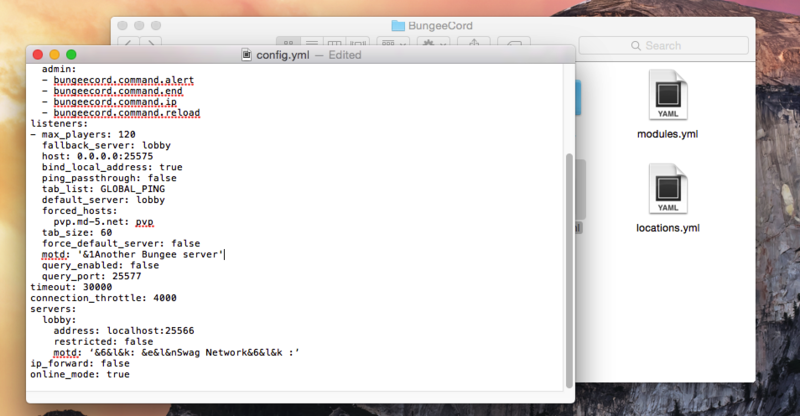 Default_server and force_default_server means what server people will connect to when they connect with BungeeCord. If the default server is lobby and force_default_server is set to true, then every time someone joins, they will connect to the lobby server first. To change the MOTD, make sure you are changing the MOTD under listeners (if you have force_default_server: true, then you must change the MOTD of whatever the default server is.) In this case the default server is lobby, so we must edit the MOTD under it. And if you are running a cracked server, change online_mode to false. 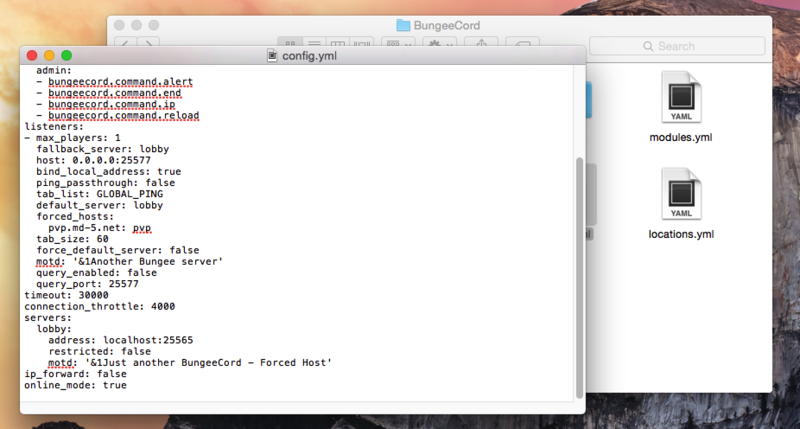 Now you are all done with configuring BungeeCord! Now lets add your servers! You can basically just copy the lobby server as many times as you need and edit it to fit your needs. Once done, go to File>Save and close TextEdit. 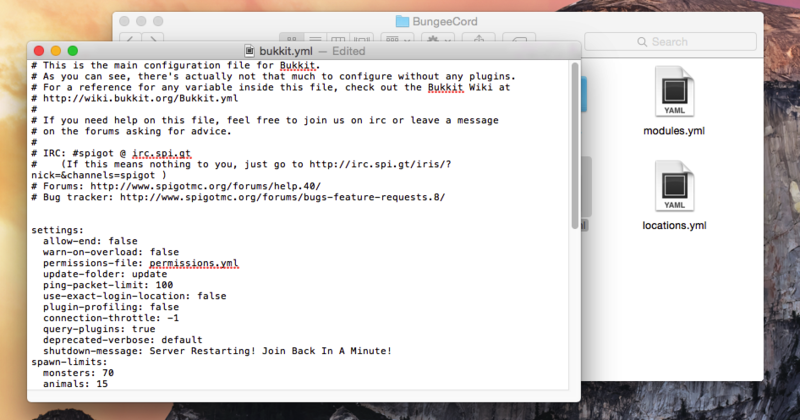 Again open it by right clicking the bukkit.yml and select Open With>Other>TextEdit. Once edited you can go to File>Save and close TextEdit, or press Command(Apple key)+S, then close TextEdit.